← Around the World in 48 Sips! Please join us for a special Winery Spotlight event, featuring Chalk Hill Estate Vineyards and Winery. Chalk Hill Estate is one of the most spellbinding wineries in California. Hidden in the rugged foothills of the Mayacama Mountain range that divides Napa and Sonoma County, the winery offers extraordinary scenery, a sense of serenity and seclusion, and one of the most providential climates for grapes in all of California. 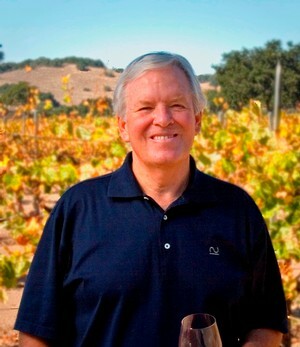 ESTATE HISTORY: Founded in 1972, by Fred Furth, Chalk Hill Estate produced its first wine in 1980 from grapes grown on extraordinary vineyards set in the rolling hills of eastern Sonoma County. Over the intervening years, the winery has helped pioneer and establish the Chalk Hill AVA as one of the top winegrowing regions in California. Today, this 1300+ acre property includes around 350 acres of vineyards, a winery, a hospitality center, culinary garden, residence, stables, equestrian pavilion, sports fields, fishing and swimming ponds and a wilderness area. The winery makes limited quantities of Chardonnay, Sauvignon Blanc, Estate Red, Pinot Noir, Pinot Gris and Semillon as well as several small lot wines. VITICULTURE: From dramatic hillsides to vineyard gardens, from dry creek beds to forests of native oak, the most prominent feature of Chalk Hill Estate is diversity. Soils vary with elevations and range from ancient alluvial deposits of sand, gravel and clay to young volcanic soils strewn with rocks and boulders. A distinctive layer of volcanic ash lies under much of the top soil inspiring the name “Chalk Hill.” The viticultural team led by Mark Lingenfelder has spent 35 years studying and mapping the Estate’s complex terroir. Thanks to their efforts, each individual block (60 total) has been planted to the best possible variety, clone, rootstock, trellising system, row orientation and vine spacing. More than two-thirds of Chalk Hill remains uncultivated. The winery’s vineyards are thoughtfully woven amongst the native oak woodlands, meadows and streams. The vines are maintained using low-input, sustainable viticultural practices to preserve the long-term viability of the ecosystem. WINEMAKING: Making great wine starts by understanding the nuances within each vineyard site. Harvesting precisely when the grapes have the greatest flavor, balance and concentration is the only way the vineyard expresses its unique character. The winemaker then coaxes the best out of every grape with a minimalist approach and gentle handing. Each vineyard and winemaking step contributes to our world-class red and white wine programs. 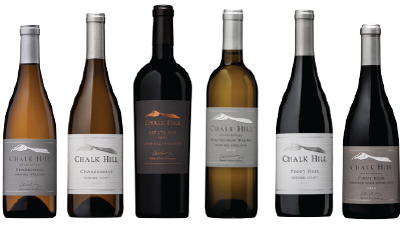 Recognized by press and consumers alike, Chalk Hill has received 125 scores of 90 or higher from Robert Parker, Wine Enthusiast and Wine Spectator combined. This entry was posted in Winery Spotlight Tastings and tagged Bill Foley, Chalk hill, Chalk Hill Estate, Chalk Hill Estate Vineyards, chalk hill wines, chardonnay, Estate Pinot Noir, Estate Red Blend, Estate wines, Foley Wines, local wine event, local wine tasting, pinot noir, Sauvignon Blanc, sonoma wines, tasting, tasting event, tasting station, wine, wine event, wine portfolio tasting, wine styles, wine tasting, winery spotlight, winestyles. Bookmark the permalink.